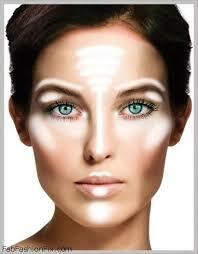 Before beginning your highlighting and contouring, you must first determine your face shape. Faces can be oval, rectangular, round, heart-shaped, oblong, diamond-shaped, or triangular (including inverted triangular). To determine your face shape, pull all of your hair back tightly and examine your face in the mirror, looking for the following attributes. A measuring tape may be used to measure the length and width of the face for a more precise determination. OVAL: Oval-shaped faces have a length equal to 1.5 times the width of the face, with forehead and jaw equal widths. RECTANGULAR: Rectangular faces are 1/3 longer than the width of the face and have strong angles on the forehead and at the jawline. ROUND: Round faces are as wide as they are long, but with soft, rounded edges. HEART-SHAPED: Heart-shaped faces have the most width at the cheek, eye, and forehead areas, with a narrow to pointy chin. Sometimes they will also have a high forehead. OBLONG: Oblong faces are as long as it is wide. Straight sides, a high forehead, and larger than average distance between the bottom of the lip and the tip of the chin are common attributes of the oblong face. DIAMOND-SHAPED: Diamond-shaped faces are characterized by a narrow forehead and a narrow chin with the widest point at the cheeks. TRIANGULAR (and INVERTED TRIANGULAR): Triangular faces are wide at the forehead and narrowest at the jawline; inverted triangular faces are widest at the jawline and narrowest at the forehead.Determining your face shape will help you decide where to place your highlights and contours and what features you’d like to define or downplay. Highlighting certain features of the face can be super flattering for the spring time, if done properly. By illuminating specific areas of the face, you’re putting them in the spotlight, but don’t think taking a face powder with tons of shimmer and applying it all over will give you a flattering look. All good things must come in moderation (even glitter).When it comes to brightening any part of the skin, it’s always a good idea to stick with the “less is more” mindset. Features like cheek bones, under the brow and cupids bow, nose area, chin and forehead are all prime targets to apply some sort of illuminator. We put together every highlighter tip for your face, from where to put a brightener to which products you should be using. Take a look through the slideshow above to see some of our favorite celebrities exemplifying the highlighted, fresh-faced look.